Description: Norfork Southern Railway SD40-2 3291 at Danville, Kentucky on September 7, 1985, Kodachrome by Gib Allbach, Chuck Zeiler collection. Description: Georgia Power Plant Scherer empty train arrives at NS Debutts yard with the radio car and slave unit up front. Description: NS 3274 leads a freight westbound through Batesburg-Leesville, SC on the R-line headed from Columbia to Augusta. Description: NS 3274 leads a westbound freight through Batesburg-Leesville, SC on the way to Augusta on NS's R-line. 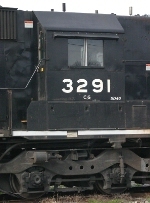 Description: A high hood SD40-2 working in the Midland industrial park. Description: A southbound auto train passing the SOU 3291 at the McDonough yard. Description: NS Southbound Freight Train 339 at Irondale, Al. Description: NS 3291 is in charge of today's HA13 as it heads back to the yard after switching on the East Penn Ry. Description: NS Hi-Hood SD40-2 #3291 pushes the BRW push-pull transfer at the BRW/NS interchange, Three Bridges. Description: NS Hi-Hood SD40-2 #3291 pushes the BRW push-pull transfer at the BRW/NS interchange on the NS Lehigh Line, Three Bridges. Description: Washington, NJ local H65 on CNJ Bridge over Delaware R. from Easton, Pa to Phillipsburg, NJ with a pair of hi-hood engines. Description: T-71, the Cleveland switcher, rests by the old depot. Description: As Forrest says,"I may not be a smart man, but I do know what an SD40-2 is". Lettered wrong at the shop? Description: Former Southern SD40-2, NS 3291, leads former NW SD40-2, NS 1633 into Golden Gate to drop off some cars on its way to Wayne City IL. Description: NS P42 picks up speed at Magnolia with a long cut of cars in tow. Description: NS P42 awaits P86 in the Hayne Yard to clear up before leaving for Gaffney.